Harness straps, seat type, child's size…there are all sorts of things to think about when choosing a car seat and buckling kids in safely. Last month, Molalla Drive 2 Zero and partners helped more than 20 families learn the basics of car seat safety. Molalla Drive 2 Zero (led by Lynn Blatter) teamed up with Doernbecher Children's Hospital and American Medical Response Ambulance Services to hold a car seat safety education event at the Molalla Fire Station as a strategy to reduce fatal and serious injury crashes. They initially started the program in response to a request after a crash near Salem took the lives of an entire Molalla family. This was their second event, and Blatter said they are committed to continuing the program. 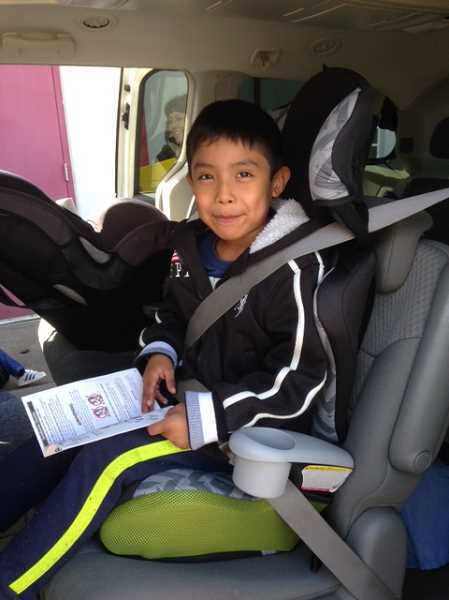 At the event, certified technicians taught parents about safe installation of their car seats and the rules on the appropriate car seat or booster seat for their child's age and weight. "With the new rear facing car seat law (child must be in a rear facing seat now until the age of two) and some confusion about how big a child must be to graduate into a seat belt, the education we are doing is helping families keep children safe in the event of a crash," Blatter said. Afterward, families who attended participated in a survey. Here are a few responses to the question, "What new information did you learn from this event?" "Babies should stay in rear-facing seats until two years old so they don't break their legs in a crash," one person said. "Even at 10 mph you should always wear your seat belt," another said.